Heat the refried beans in the microwave or over the stove top until warmed through. Over a gas burner, heat the tortillas directly over the flame until each side just starts to char slightly. If you don't have a gas burner, use a nonstick skillet over high heat and char tortillas until bubbly and browned on each side. Spread the refried beans on each tortilla, placing two on each plate. Top each tortilla with a generous spoonful of salsa. Sprinkle each with jalapenos and feta cheese. In a large nonstick skillet, add the oil and heat over medium heat. Crack 4 of the eggs into the pan and bring down to medium low. Let them cook until the whites are set, about 5 minutes. 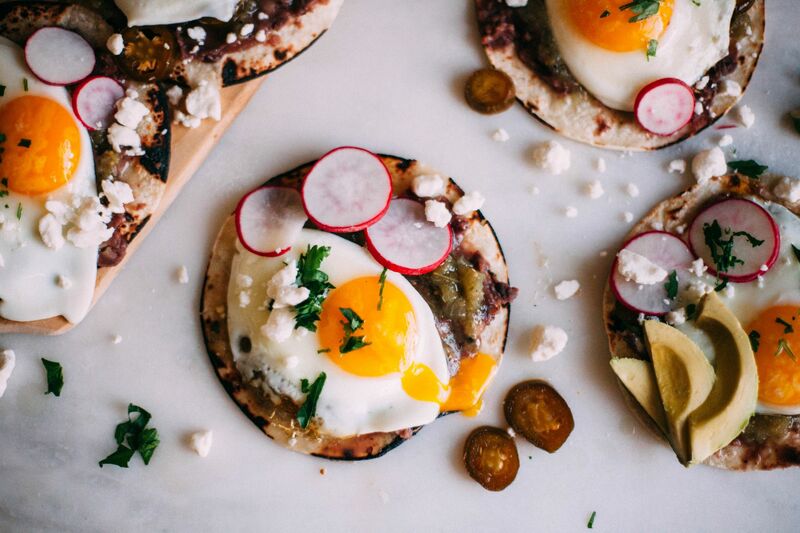 Put each egg on top of a prepared tortilla. Repeat with the remaining eggs, topping the remaining tortillas with each egg. Top with radishes, cilantro, avocado, and serve with hot sauce and limes.